• Keep all flames or sparks away from the battery. The battery produces hydrogen gas which may explode if exposed to flame or sparks. 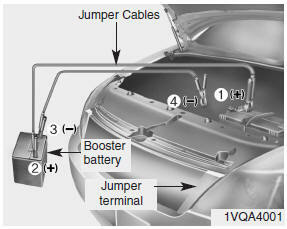 • Do not attempt to jump start the vehicle if the discharged battery is frozen or if the electrolyte level is low; the battery may rupture or explode.